Life lately has been crazy, especially since arriving from our vacation. I knew once coming back our lives would shift a little. It turns out to that our lives have shifted more than just a little. It’s all exciting, but also, rather intimidating. See, I’ll be working away from home more and Peter will be home more. 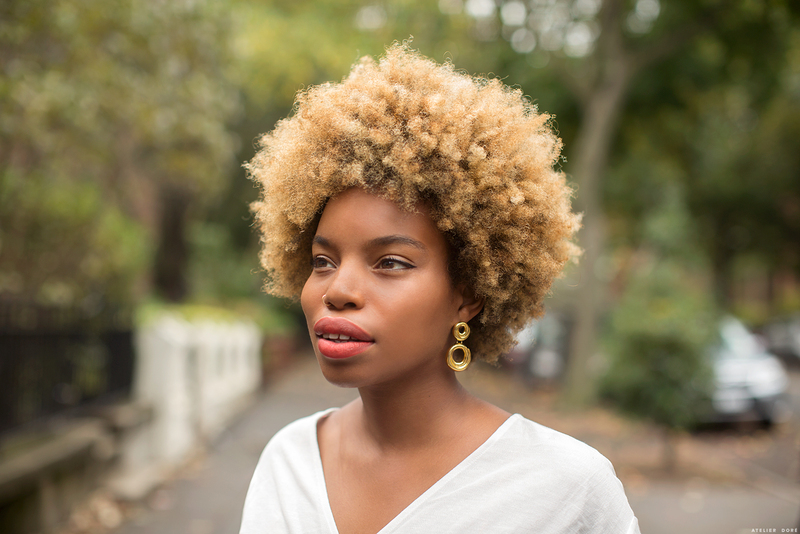 I just started an amazing new position with a fantastic jeweler, helping with her marketing and branding, and this, in addition to this little blog and a few styling gigs, takes me away from home more. I’ve always been one to happily juggle many things, but this change required more family shifting and shaping. I’m really thankful that Peter has a successful career that he loves, and that also gives him and myself the opportunity to tackle new things, while also balancing the family and parenting load. I’m thankful that for the time being, he’s shifting and scaling his work load back so I can really live out some of my dreams as well. With all of that said, there’s a lot of things that Peter needs to adapt to in our home with the kids. I created a lot of the routines and schedules, and he has to learn how to navigate them and to also create his own. With me working more, it means that I can’t make dinner a few times a week like I’d like to. This, and not nursing Oak as much during the day, are some of the biggest changes for me. 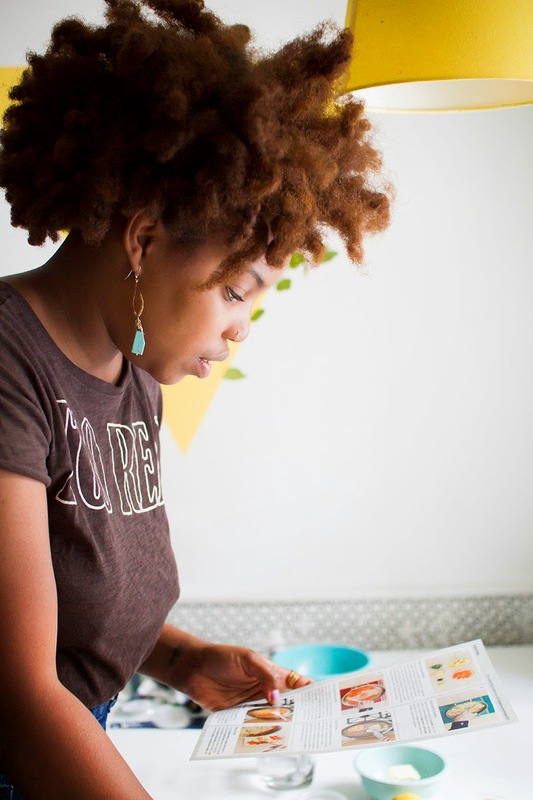 Despite trying to always juggle a few jobs, I find great success and joy in being a homemaker. There’s no better sign of love than creating a meal. I’m not the best cook, but I feel as though I am the best at making my family smile through cooking. And that my friends… is where it’s at. When Blue Apron reached out to me asking if I wanted to give them a try, I immediately said yes. With Peter taking more of an at-home work load, I knew that if he (and I-let’s be honest) had a little help in that department during this transition in our lives, than all the merrier. 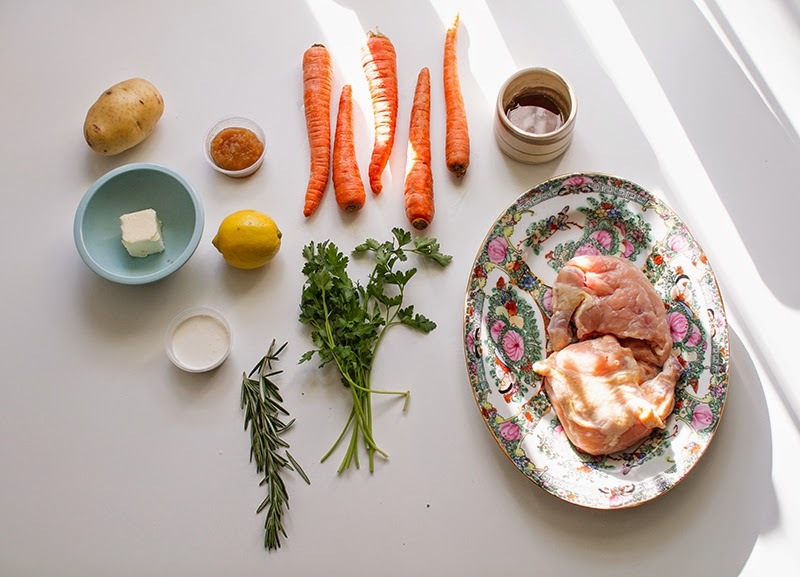 If you haven’t heard of Blue Apron yet, they’re a meal delivery service that delivers farm fresh ingredients, recipes, and perfect proportions right to your front door. In fact, we hadn’t even arrived from vacation when our box arrived. Our building’s super gladly brought the box inside our apartment upon my request and all of the food was still cold and fresh once we got home from the airport later that night. Even though there are four of us, we chose to receive a meal for two at $9.99. This kind of shocked me because in reality, here in the city, we pay that much-at least- for organic and farm fresh ingredients for a meal. And it probably goes without saying, but our ingredients require me to actually meal plan or create new things. No handy recipes. I love how Blue Apron takes all the fuss of planning and cooking a balanced meal out of the everyday. 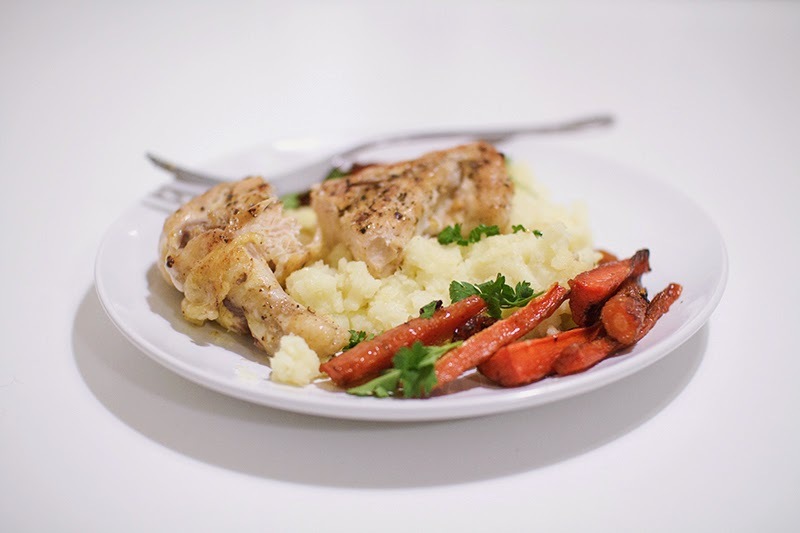 On Sunday afternoon, we chose to cook the Pan- Roasted Chicken with Mashed Potatoes and Maple-Glazed Carrots. I love how each dish comes with a super simple step by step. There’s little room for error, and it’s easy to have kids join and give a helping hand. 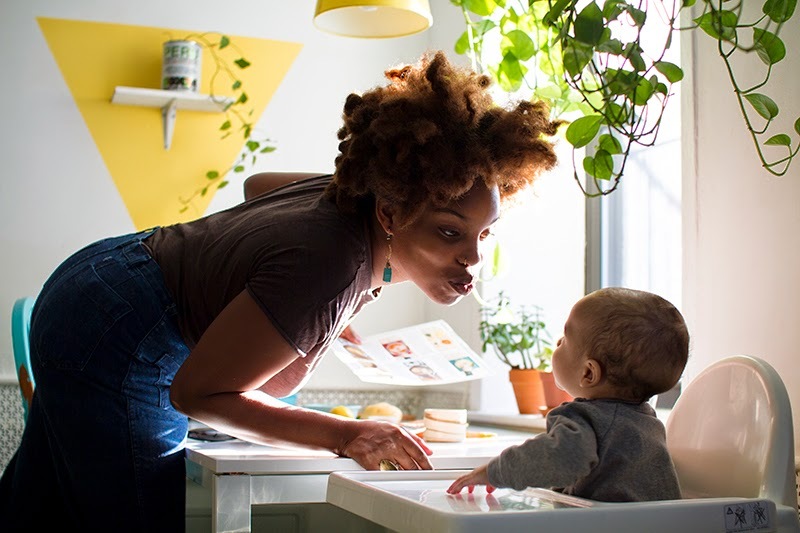 Each meal can be prepared in 40 minutes or less, which will give Peter a little more free time when nights with two little ones gets kind of crazy. Our meal was incredibly delicious, and I think Peter broke a record for how many times the statement “this is so much fin!” can be used within an hour. As I type this, he’s in the kitchen now, and I here him chanting ” here we go, here we go, here we go now” as he’s preparing another Blue Apron meal. We have officially been converted, and I look forward to having Peter create delicious Blue Apron meals with ease as we navigate this transition. Cheers to welcome change and healthy and balanced meals and family! *First 50 readers will get two meals of their first Blue Apron order free! Just click here. -Blue Apron delivers to 80% of the country and shipping is always free! – There is no commitment. 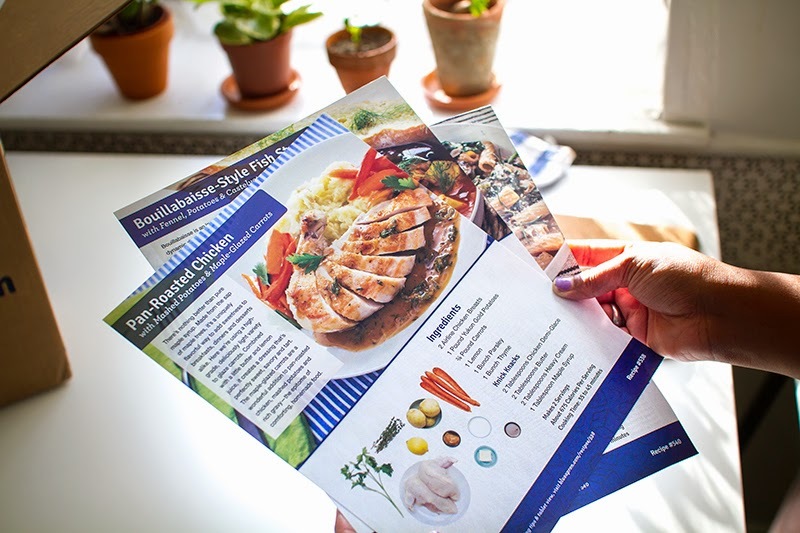 – Blue Apron offers a 2-person meal plan and a family meal plan. 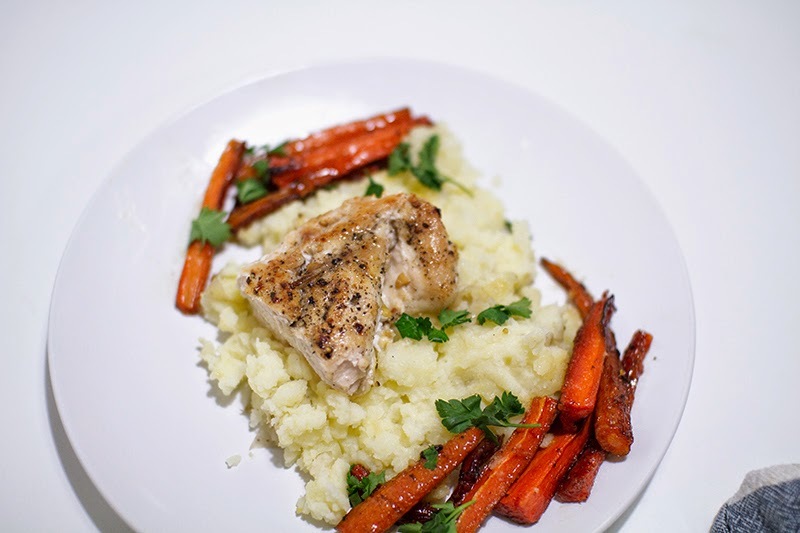 This post was in partnership with Blue Apron, a meal delivery company we enjoy. Thank you for supporting the partners that make this blog possible. Amazing. I've never heard of this service, and that meal looks incredible! I love cooking and I often find out that I don't have that one ingredient in the recipe…and no time to go buy it! Also, that dish looks delicious! I live in France si I hope they will arrive here soon! kind of a minor point i suppose…but i can't stop looking away from that gorgeous plate in your shot of the ingredients. so pretty! and, i love how organically you shared this post. it seems like a great service to use now and then — especially for a busy mama. hahah I love that plate too!!! And you're always the sweetest Bridget! I try really hard to only talk about brands and companies that we actually use or will use. Thanks for noticing.